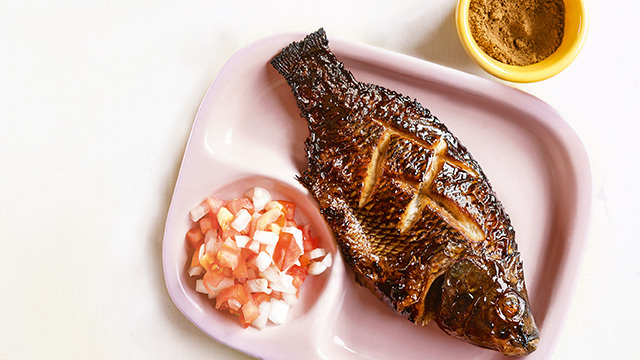 The flavorful oil not only cooks the flaky fish, but also prevents it from sticking to the pan. In a large, nonstick sauté pan over medium heat, heat oil. Set aside. Season fish fillets with salt and pepper to taste, on both sides. Lightly crush garlic and spring onions to release flavors, and squeeze half the calamansi over fish. Once oil is hot, add garlic, spring onions, and remaining calamansi to the pan. Let aromatics cook until heated through and fragrant. Slip fish into the oil, and let simmer until cooked through, flipping halfway as needed. Remove fish from oil, sprinkle with parsley, and serve with steamed rice. Recipe originally published in the June 2017 issue of Good Housekeeping.